Temperature, not snowfall, has been driving the fluctuating size of Peru's Quelccaya Ice Cap, whose dramatic shrinkage in recent decades has made it a symbol for global climate change, a Dartmouth-led study shows. The findings support many scientists' suspicions that tropical glaciers are rapidly shrinking because of a warming climate, and will help scientists to better understand the natural variability of past and modern climate and to refine models that predict tropical glaciers' response to future climate change. Dartmouth glacial geomorphologist Meredith Kelly and her lab team used field mapping combined with the beryllium-10 surface exposure dating method and ice cores obtained by Ohio State University paleoclimatologist Lonnie Thompson to examine how the Quelccaya Ice Cap has expanded and retreated over the past millennium. It is the first time that a record of past glacial extents has been compared directly with an annually dated ice core record from the same ice mass. During the last millennium, a significant cooling event known as the Little Ice Age occurred, but scientists don't know what caused the cooling or its geographic extent. The Dartmouth-led team determined beryllium-10 ages of moraines – or glacier sediments—that mark the past positions of Qori Kalis, an outlet glacier that has been monitored by Thompson since he first visited Quelccaya in the early 1960s. The Quelccaya Ice Cap, the largest ice mass in the tropics, sits 18,000 feet above sea level in the Peruvian Andes. The results show that Qori Kalis advanced to its late Holocene maximum position prior to 520 years ago and subsequently retreated with only minor re-advances since that time. The comparison of the moraine record with the ice core record suggests that temperature was the driving force of glacial expansion and retreat, says Justin Stroup, lead author and a PhD candidate in Dartmouth's Department of Earth Sciences. "This is an important result since there has been debate about the causes of recent tropical glacial recession – for example, whether it is due to temperature, precipitation, humidity, solar irradiance or other factors," says Kelly, a co-author of the study. "This result agrees with Professor Thompson's earlier suggestions that these tropical glaciers are shrinking very rapidly today because of a warming climate." Furthermore, the ebbs and flows of other glaciers in tropical South America are similar to the Qori Kalis extents, indicating a regionally consistent pattern of past climate conditions. On a global scale, the results suggest that glaciers were larger than present and depositing moraines in both northern and southern hemispheres at about the same time, indicating that the climate mechanisms which caused the late Holocene cooling likely influenced a globally synchronous pattern of cooling. The study appears in the journal Geology. Found a shrinking glassier? Good for you. Just move little south, and witness the largest South American ice shields in Patagonia growing. it is largest glassier in Patagonia. No they are not! They are shrinking faster than they ever have! Oh look at you, you little cherry-picking denier you!! From your own cite: The Perito Moreno Glacier is one of only three Patagonian glaciers that is growing. "The (Northern) ice field has 28 exit glaciers, the Southern ice mass feeds dozens of glaciers in the area...."
So, wow, out of "dozens" you have found a reference to the three that are growing! Well picked! Let's see some peer-reviewed research to support this outlandish claim of yours. No surprise. All the science concludes the exact opposite. I'm trying to find Crysat-2 backed up publications confirming "accelerating ice mass loss" of Southern Patagonia ice field. Most of the other publications are asserting that was shrinking since 1650. (While believers insist that Little Ice Age was not global). So, it is just recovering since its maximum, and any talk about accelerated ice loss is pure fantasy. "Our results indicate that, taking into account the uncertainties, the decline in sea ice volume in the Arctic between the ICESat (2003-2008) and CryoSat-2 (2010-2012) periods may have been less dramatic than reported in previous studies"
The reason you can't find any backup for your spurious claim is for the simple reason that virtually all research finds that the Patagonian glaciers have been in near-continuous retreat since the end of the LIA, and most definitely since the end of the 19th century --in fact, the majority of them have disappeared entirely. And your's is sheer and unmitigated willful ignorance. This information is freely and easily available on the web. Solar minimums cause the jet stream to meander south; this is well-established. Even the BBC has recently (Jan '14) discussed the undeniable causative action of lower ultraviolet levels on global weather patterns. The jet stream's southern momentum allows the undue influence of 'polar vortexes' upon the northern hemisphere. Maunder Minimum, anyone? But really just ignorance. Go dig up a few peer-reviewed citations for your assertions, and then perhaps there will be a basis for real discussion. Until then, @ogvorker,you're just another denialist hump. What is causing the ice to grow in Antarctica? Temperature? Why isn't this in the headlines? No, its because the ice is not growing. As has been discussed numerous times on this board, the ice EXTENT around Antarctica is larger, a direct result of the gigatonnes of ice loss on the continent due to the shrinking VOLUME, meaning that OVERALL there is LESS ice. How does your god deal with your misrepresentation (that means lies!) verkle? Is that not a sin? Go dig up a few peer-reviewed citations for your assertions, and then perhaps there will be a basis for real discussion. You require peer-reviewed data to conclude that the Sun is the primary source of temperature flux in the solar system? "Haha" indeed, O noble defender of the status quo. John Christy is one of many who have turned-coat on the alarmist agenda and it's propagation... what of the rest in the IPCC? I won't hold my breath! 1400 years or 200 ... CAUSE can never follow EFFECT, sir ... please enlighten us if I am mistaken -- Lol! Oh my! Here is an unfortunate pronouncement from one such godman. "A co-founder of Greenpeace told lawmakers there is no evidence man is contributing to climate change, and said he left the group when it became more interested in politics than the environment. "Patrick Moore, a Canadian ecologist and business consultant who was a member of Greenpeace from 1971-86, told members of the Senate Environment and Public Works Committee environmental groups like the one he helped establish use faulty computer models and scare tactics in promoting claims man-made gases are heating up the planet. "There is no scientific proof that human emissions of carbon dioxide (CO2) are the dominant cause of the minor warming of the Earth's atmosphere over the past 100 years," he said." -And I thought they had this AGW business all figured out so even a godder could accept it. Silly me. ""The truth, and this is frustrating for policy-makers," declared John Christy in Nature four years ago, "is that scientists' ignorance of the climate system is enormous." Now he and fellow climate scientist Richard McNider have argued in the Wall Street Journal that widespread, perverse disregard of gross climate-modeling deficiencies is leading to acceptance of huge overestimates of warming, to needless regulation, to social harm, and to a clear need to invert common belief about climate-science legitimacy." 'widespread, perverse disregard"... "gross climate-modeling deficiencies"... "huge overestimates of warming"... "Physics Today"... "Wall Street Journal"... Well what do they know right? I wonder what Perez Hilton will have to say about all this? We have discussed this last time. Your "gigatonnes" of glacial ice melt is literally drop in the bucket compared to the overall volume of Southern Ocean [which is measured in *cubic kilometers*]. Are you serious thinking that 1/250000 (the ratio of fresh to salt water, calculated via easy wikipedia lookup of Southern Ocean volume) can have any measurable impact on sea ice formation? What next: antarctic ozone hole ate your warming? Keep clutching at straws. This result agrees with Professor Thompson's earlier suggestions that these tropical glaciers are shrinking very rapidly today because of a warming climate. Yet Kelly's study says nothing of the sort. In contrast to nearby paleoprecipitation proxy records that register wet conditions throughout the YD, the recession of Quelccaya from the Huancané II moraines occurred by ca. 12.4 ka. Quelccaya recession may have been influenced by Southern Hemisphere warming subsequent to the ACR, rising atmospheric CO2, or, perhaps, other factors such as El Niño–Southern Oscillation variability. To sum up: The retreat of many glaciers is due to reduced snowfall. However this study correlated glacier retreat 12,400 years ago to warming temperatures rather than lower snowfall. That does not necessarily mean temperatures are the dominant factor today; it merely suggests it as a possibility--still a subject of much debate. Therefore, we suggest that Quelccaya recession at 12.4–11.6 ka may have been influenced by warming. This recession occurred contemporaneously with Antarctic warming and increasing atmospheric CO2 (EPICA community members, 2004; Monnin et al., 2001), and is similar in timing to the recession of mountain glaciers in southern midlatitude locations (Kaplan et al., 2010). 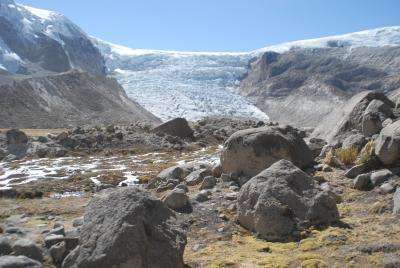 The study establishes the possibility that the retreat of Quelccaya between approximately 12,400 and 11,600 years ago was influenced predominantly by warming rather than lower snowfall.